Nothing can beat the thrill of flying down a rushing river at breakneck speeds! If you’re looking for a heart-pounding adventure out on the water, the state of California is the ideal destination for you. The Yosemite area, in particular, is the perfect setting for spending time in the great outdoors. In addition to hiking through breathtaking scenery and exploring countless mountain trails, this area also provides numerous opportunities for sensational whitewater rafting. With amazing views and exciting rapids, the Tuolumne River is constantly drawing kayakers, canoers, and rafters as it winds through miles of incredible natural beauty. Discover some of the best companies for Tuolumne River rafting to start planning your journey along one of the state’s most exhilarating rivers! Where Is the Tuolumne River? This river is located just west of Yosemite National Park, about 30 minutes away. The length of the entire river totals to 149 miles and flows through Central California. What Are Some of the Best Rafting Outfitters? Sierra Mac: One of the oldest rafting outfitters in the area, Sierra Mac River Trips can offer you a peaceful, relaxing float trip or a thrilling, fast-paced ride! OARS: With different options likes wine and beer tasting trips, OARS is an excellent choice for Tuolumne River rafting! They also offer excursions to creeks and waterfalls and you can choose from trips that last one, two, or three days. All Outdoors: Offering excursions on not just the Tuolumne River but ten California rivers total, All Outdoors Rafting provides some of the best adventures near Yosemite National Park. You’ll get instructions from talented guides as well as delicious foods! ARTA: ARTA will ensure that you have the best possible Tuolumne River rafting experience! They’ll take you along the river and show you the finest sights of the surrounding area during your exciting ride through the rapids. Zephyr: The Class IV rapids of the Tuolumne River won’t intimidate you a bit with the help of Zephyr Whitewater Expeditions! This experienced company has been serving the local area since 1973 with their top-notch gear and talented guides. 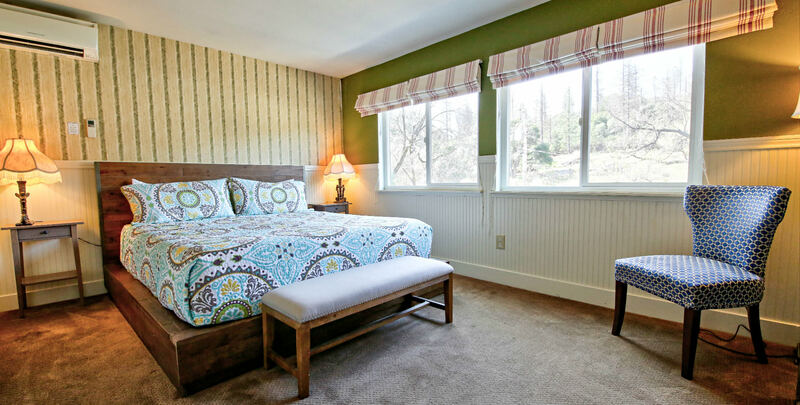 After taking on the challenge of Tuolumne River rafting, come relax in the comforts of Hotel Charlotte, a historic bed and breakfast in Groveland, California, located at the gateway of Yosemite National Park. We offer luxurious lodging and outstanding amenities. Here at our bed and breakfast, you can choose from staying in one of our twelve beautiful rooms or renting one of our cozy apartment rentals, which have the perfect amount of space for families or groups. We also have a lovely living room, friendly and helpful staff, and even our very own Fork and Love Restaurant, so everything you need is right here! Don’t wait another minute to start planning your dream vacation; check our availability and book your stay today! While you’re planning your trip, be sure to download our free Vacation Guide! This is your ultimate resource for finding the best things to do in and around Yosemite National Park!